With their clutching, disembodied hands, recent sculptural works by Josh Kline evoke the discarded limb of The Fifth Element. 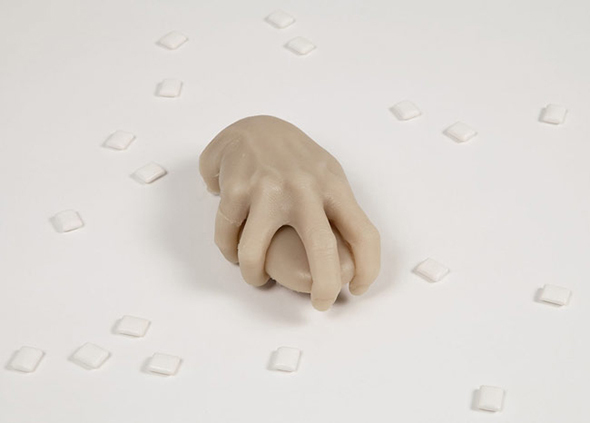 For the series Creative Hands (2011-), Kline fused silicone cast likenesses of friends' and colleagues' hands holding a selection of tools and consumables emblematic of prosumerism and the blurring of work and social life—a computer mouse, an iPhone, a carpal tunnel wrist brace, Purell hand sanitizer—displaying the resulting hybrid objects on backlit shelves. Writing for Texte zur Kunst, Kerstin Stakemeier described the series as reverse prostheses: as in Besson's film, "the hand is attached to the object and ends with it." If the tool is traditionally understood as an extension of the human hand, here the hand extends from the tool. Josh Kline, Retoucher's Hand with Mouse (Jasmine Pasquill), (2011). From the series Creative Hands. 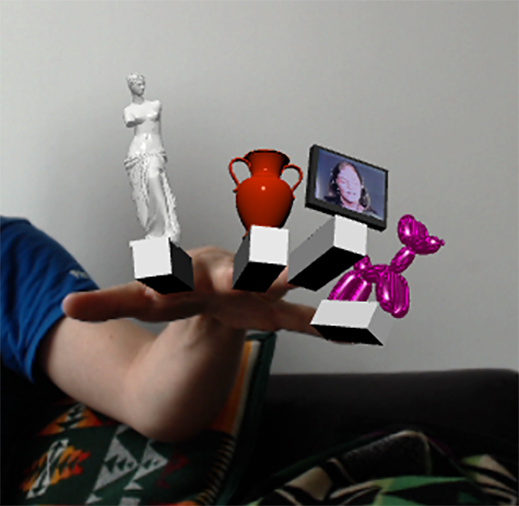 Tastemaker's Choice (2012) also features the hands of Kline's peers, including Alex Gartenfeld and Marco Rosso, this time 3D printed using a transparent material, grasping a replica of a bottled beverage of the subject's choice. The hand/product hybrid is filled with this chosen liquid which, knowing no barrier between bottle and hand, illustrates the (literal and metaphorical) flows between humans and the things they hold. The coincidence of Kline's means of production with the congelation of objects and hands merits special attention here. 3D printing has been billed as a harbinger of a second Industrial Revolution, and it was during the first that a theory of technics emerged, with the hand and a refusal of the animate-inanimate binary at its core. As Bernard Stiegler explains in Technics and Time I, there was a turning in metaphysics in this era: where natural scientist Jean-Baptiste Lamarck represented the European intellectual consensus in his 1809 description of the strict division between "two classes of body"—the "non-living" and its opposite, that which is "inevitably doomed to die," Engels described a "dialectic between tool and hand that was to trouble the frontier between the inert and the organic." In "The Part Played by Labour in the Transition from Ape to Man" (1876), Engels argued that humans evolved in dialogue with their tools. Having been shaped by our use tools over tens of thousands of years, our hands are already technological. Josh Kline, Tastemaker's Choice, Detail (2012). If, for Engels, this was partly cause for celebrating the human as the being with a special relation to labor and art, our proximity to technology also made possible a future in which increasing productivity would lead to a concentration of wealth in the hands (so to speak) of the very few. Do we find in the present an echo of Engels' future? Wealth is certainly concentrated, but he could neither have predicted the nature of Post-Fordist work conditions in which immaterial labor is the order of the day, nor entertained a demanualized state of art in which "[f]acility is downloaded to the manipulation of technology." Engels conceived of (productive) labor as that which drove the hand's evolution to achieve (in unproductive labor) "the high degree of perfection required to conjure into being the pictures of a Raphael." Faced with Kline's art, and with the age of 3D printing as a whole, we cannot speak triumphantly of labor as an evolutionary force that reshapes the hand around its tool, thereby attaining higher degrees of perfection. In contrast with the machinery of large scale industry, the devices we use for immaterial labor are sleek and pocket-sized, ergonomically built and anthropomorphised. Yet they reshape the hand in crippling fashion, limiting its activities to a set of patented gestures. For Engels, the hand was given freedom from productive labor in the autonomous work of art; in Kline's works described above, the hand is so thoroughly defined by technologies supporting intermingled productive and unproductive labor that its only emancipation comes from breaking with the body entirely—to end up on retail display shelves in the form of freely circulating products. Camille Henrot, Grosse fatigue. Photo courtesy of the artist and Kamel Mennour Paris. 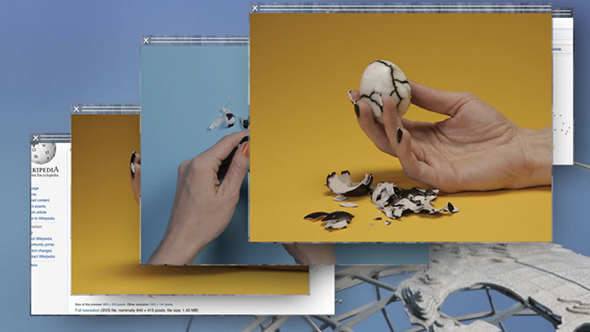 A contrasting depiction of the laboring hand as master of technology can be found in Camille Henrot's video Grosse Fatigue (2013). While a narrator offers a sweeping history of the world, finely manicured hands traverse physical and digital interfaces, accessing multiple overlapping GUI windows displaying natural history-related imagery found online or during visits to the vaults of the Smithsonian Institute. As a rhythmically intense aural and visual bombardment, this work metaphorizes the impossibility of processing all the knowledge at our disposal, and the dilemma of where to begin. The transfer of resources to an internet that knows none of the limitations previously imposed by a building's walls and opening hours means we carry the burden of constant access in our hands. The substitution of physical documents with digital files, of traditional architecture with digital infrastructure, implies weightlessness. But "immateriality" is heavy. By incorporating hands that touch and interact with objects in various ways, Henrot encourages us to imagine how knowledge might feel, even as growing swathes of data, relying on physical and digital infrastructure alike, stretch far beyond our grasp. Fatigue is perhaps insufficiently conveyed, then, given the expert grip and precision of Henrot's hands—holding a delicately peeled boiled egg, carefully positioning statues, throwing marbles, or turning book pages. These hands do not look tired, and at a short 13 minutes duration, this work hardly weighs on the viewer's mind. In fact, what comes across in Henrot's video is a fantasy of mastery, the hand (as the representative of human agency) in complete control of a universe of information; there is no indication that technology is acting on the hand as well. Benedict Drew, Heads May Roll, (2014.) Detail. In Benedict Drew's show "Heads May Roll" (February 19 - April 20, 2014, Matt's Gallery, London), access to information was not presented as the path to mastery. Anxiety was contrastingly palpable, and mental and physical burnout manifest in the shaking parts of a person who has, according to one of the videos on view, "seen every image." Dislocated hands featured in three videos installed in psychedelic sci-fi settings: the first, installed in a minimal white space, depicted hands caught in repetitive spasms. The second and third, in contrast, showed hands manipulating clay or electrical equipment, with neither activity entailing progress toward a finished work. These were installed in a chaotic, maximalist environment, shown on small cube monitors set on the floor beneath platforms supporting other screens which showed widescreen footage of green goo and YouTube-derived footage of astronaut Chris Hadfield demonstrating zero-gravity tears, followed by the word "EXHAUSTION" in fat pink lettering on a green background. The liquids depicted here were not of the identity-defining, energizing, "healing" kind employed in Tastemaker's Choice; rather, abject substances oozed and wobbled. If in the first video hands evoked a nervous state of inefficiency presumably induced by the overconsumption of images, those in the second and third spoke of a defeated desire to overcome formlessness through skilled making. The Dark Pool (2014), a new work by David Panos featuring the two-screen video "Green Goo Gallerte" / "Table of Gestures" (excerpted as Congelation 1 for the exhibition Bitrates), choreographs a struggle between hands and objects. Panos uses green screens to rip bodies from frames, dramatizing the violent tension between the hand as extension of a subject's will and subject of external forces. 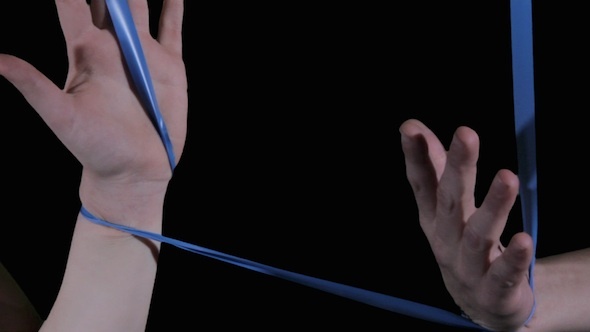 The most engaging passages - startlingly delicate against a grinding soundtrack broken by thuds and mechanical sighs - are those showing dancers' hands in close-up, pulling their fingers through ropes and blue tape. Mastery over objects appears no more fruitful than it does in Drew's work, but at least hands have been spared reduction to the gelatinous state the word "Gallerte" refers to. In other scenes, their expression is curtailed by the more mundane demands of domestic or service industry labor–the setting up of tables similar to those found in 3D form in the exhibition space. The installation element of this work comprises insubstantial IKEA furniture, mutated through the addition of printed and mounted green screen, cold metallic elements and contours of human flesh. David Panos, The Dark Pool (2014). Still frames from video. If Kline uses hands to diagnose the defeat of human agency by the object, Henrot's hands assert mastery; where Drew's hands succumb to exhaustion, Panos maintains room for manoeuvre between the two poles. In all cases, hands act upon viewers, detached from bodies yet still enacting desire. Of course, the hand is identified not only with labor, but also with connection (often mediated by technology) between people. Hands recur in Cécile B. Evans's work: in Made with Minds (2013), Trilogy (2012), and this year in video loops greeting the user of AGNES (a chatbot that lives on the Serpentine Galleries website), where they indicate the artist's investment in the emotive capacities of gesture. If we normally avoid responding to spam, it is harder to refuse a spambot specifically programmed and attuned to the techniques of affective computing. AGNES displays video loops of varied trios of familiar actions, several of them inspired by the gifs at criticalhandgestures.tumblr.com, as a prompt for the user to open up to an automated being: an accompanying voiceover asks that you "please select the gesture that best describes your state of being." This friendly spambot proceeds to deliver what she "thinks" the user wants. All very well in an artwork, perhaps, but in scripting AGNES to express guilt about gathering data during the performative screenings of "AGNES GOES LIVE," Evans recognizes the hand's potential instrumentalization in the interests of commercial goals. If the hand is constituted by technology, can it be trusted? The idea of hands as intermediary between remote bodies and devices was also explored in recent talks in which Harry Sanderson presented slides showing the prowess of the hand used as a tool for enticing consumers of alternative therapies. In a photo since removed from Holistic Heart Centre.com's Distance Healing Session webpage, a man illustrates a service entailing the placement of his hand on his computer screen in such a way as to "touch," and if we buy the claims, "heal" a remotely located patient framed by a Skype window. For an artist who argues for materialist conceptions of the web, cloaking the act of communication in spiritualism and mystique is objectionable insofar as it reifies the internet's capacity to connect people in "virtual" space. As Laura Marks writes in "Immanence online," "[m]aterialism is (...) a Marxist remedy to reification," which can be held against "transcendentalist understandings of cyberspace" indicating "misplaced faith in a virtual superstructure, at the expense of understanding that e-businesses are material enterprises like any other." If the hand is already a technical actant, Sanderson's objection to distant healing does not mean rejecting the effectiveness of touching via Skype but rather the commoditization of touch and its marketing as "cure." Even as the hand is increasingly enmeshed in technology, touching keyboards and phones more often than not, the role of the hand and touch in the body's sensorium is largely neglected, as the tech world carefully delegates the most rewarding sensory functions and experiences to the eyes. The hand's labor is also sensory—gripping, clutching, tapping, swiping, clicking, typing—so it follows that a desire to transcend screen space, and to privilege tactility, persists and need not be entertained in an occultist vein. Jaakko Pallasvuo. Music video for Islaja's "Skeleton Walk." Still frame from video. In Jaakko Pallasvuo's work, hands respond to a loss of the sensuous, asserting a need for the textures compromised by uniformly smooth screens. In his videos—such as Utopia (2013), The Cloud of Unknowing (2013), and The Artist's Statement (2012), as well as collaborations including music videos for Islaja (one made with Martin Kohout) and works by Oval Office (with Mikko Gaestel), which include The Comfort Zone (2013)—a sense of touch, or haptic visuality, is introduced through the incorporation of materials with visceral pull: slime and melting ice cream. Physical handmade counterparts such as Energy Objects have similarly sensual appeal. Bearing the marks of their making, Pallasvuo's technique stands in stark contrast to the industrial means preferred by Kline. Instead of calling attention to the disembodiment of the hand and its connectedness to respective tools, Pallasvuo reintegrates the hand into the body, vivifying the duality of the hand as that which makes and feels. Sandra Vaka Olsen, Sunscreenspill, 2013. C-print, fotopapir, solcreme, ramme. 30 x 40 cm. Both of our things have to do with action. The action of making things (...) There is a gesture, we make stuff which involves hands, bodies and labour. On top of surfaces. As I've done before I've used the computer screen in this series. I use water, sun crème and gels on top of the computer screen and photograph it over and over again. It's an action of going in and out of the computer screen; developing, scanning, photographing, adding a new layer of water. I almost do a sort of finger painting with the sun crème. While working I can't see what I'm doing; it's almost transparent, white on white. But when I light the photo it all comes through and I see this movement. The gesture of the hand. It's useful to read this statement in conjunction with John Roberts's writing on "Situational authorship," defined as the artist's intervention in circuits of authorship shared (because technology has broadened access to tools) by society at large. By doing so, we might see Vaka Olsen as an inheritor of what Roberts describes as the tradition of "the haptic readymade," the feminist practice of situating the manufactured or copied work as "the embodiment of those things the author has touched and loved" and as that which "tends to favor signs of hand-to-object attachment." Roberts contrasts this with another form of situational authorship, the tradition of masculine radicality in post-Conceptual practice of the '70s and '80s where the hand and affect is detached from the externally fabricated, incorporated art object. As we've seen above in the work of Kline, Panos and Drew, it is impossible to distance the digitally produced artwork from the embodied processes that went into its making. Sandra Vaka Olsen makes this point most insistently in her layering of soft and hardened matter, a process which coincides with Roberts's argument for a labor theory of culture centred around the hand. His argument throughout The Intangibilities of Form is that, as different kinds of labor amalgamate in the coming together of the hand with technology, and as the hand deskills in relation to craft but reskills in terms of "general social technique," there is potential for artists to reinscribe alternative meanings, relationships, and functions to the technologies with which they interact. In words that complement the argument made earlier for acknowledging the slim distance between Kline's series and the technologies they are made with and reflect upon, "new forms of commodification are the heteronomous site of new forms of autonomy." The introduction of new technologies into artistic labor does not undermine the role of the artist; it merely reconfigures it. The redefinition of the artist's hand is of central importance to Roberts, as he understands the value of art to be derived from the tension in its making by the work of artists and non-artists alike. However, it is often the artist who recoups this value, and it is their "veryperfect" hands, and those of their peers, that appear in most of the works discussed in this article. The many non-artist hands that participate in the lower end of the supply chain rarely have any agency in contemporary image culture at all; if they appear at all, it is as glitches in the system, as accidentally scanned hands appearing in Google Books, or as objects of unreconstructed ethnographic interest, as in Edward Burtynsky's Manufactured Landscapes. In this context, the trend for nail art offers one of the few possibilities for a more direct evocation of the role of the laborer, while entailing a reintroduction of painting and handcraft that Roberts does not discuss. If nail art often means an encounter with low paid labor in the salon, artists such as Emilio Bianchic clearly prefer DIY nails as if to refuse the gloss that belies the precarity of the nail technician and artist alike. Jeremy Bailey has recently curated a Fingernail Exhibition and established a Nail Art Museum, celebrating the hand of the artist who self produces by means of aggregation and reconfiguration, while the hyperbolically elongated nails in Pallasvuo's work are reminiscent of Ming Dynasty artificial nails, worn by nobility and upper class women to indicate the impossibility of physically laboring given the inhibiting length of their accoutrements. Images of the hand today designate a nuanced combination of artistic positions: they not only indicate concern with materialization and breaking through the screen, but also imply acknowledging the human relationship to simple and complex technological layers. "If art is always and already embedded in the technological relations of its time," it is with their hands, and now explicitly with recourse to hand imagery, that artists (as privileged laborers) determine the extent and nature of their work's implication in digital infrastructures that may emancipate or entrap. Necessarily understood as post- or cyborgian, the hand can never entirely opt out of the technical: it is a tool and a technology. Indeed, "[t]he essence of the human...is the technical; which is...the other of the human: the non-human, the manufactured, the unnatural, artificial; the inhuman even." The artist's hand, and the hands they represent and circulate, elucidate this site of confluence and its pharmacological status as both poison "Great Evil" and cure. 1 A steady traffic of hand imagery includes: Kenneth Goldsmith's "Artful Accidents of Google Books," Jasmine Johnson and Alice May Williams's "Glossary of Hand Gestures for Critical Discussion," WORKS by Alice Brooks (Lima Zulu project space, London, June 18-22 2014), and the social media output of artists such as Jasper Spicero, Bunny Rogers, Emilio Bianchic, and Jeremy Bailey. A sentence in Hito Steyerl, "Too Much World: Is the Internet Dead?" also comes to mind: "A nail paint clip turns into an Instagram riot." Images of the human hand have been prevalent throughout art history, from cave painting, to the art of the Renaissance, and in numerous twentieth century avant-garde films, but the task of interpreting these is not undertaken here. For an astute and succinct overview of the symbology of hands, fingers, and nails (claws), see Ami Ronnberg and Kathleen Martin, The Book of Symbols: Reflections on Archetypal Images (The Archive for Research in Archetypal Symbolism) (Köln; London: Taschen, 2012), 379-387. 2 As Bernard Stiegler writes of this ambiguous status, "the technical object (...) is organized inorganic matter that transforms itself in time as living matter transforms itself in its interaction with the mileu. In addition, it becomes the interface through which the human qua living matter enters into relation with the mileu." Technics and Time I, 49, (Richard Beardsworth and George Collins (trans. ), California: Stanford University Press, 1998), 49 (Originally published in French as La Technique et le Temps 1: La faute d'Epithemee, Paris: Galilee, 1994). For more on the relation between the animate and inanimate, understood through cyborgian discourse, see Karen Barad, "Posthumanist Performativity: Toward an Understanding of How Matter Comes to Matter" in Meeting the Universe Halfway: Quantum Physics and the Entanglement of Matter and Meaning (Durham: Duke University Press, 2007). 3 Laura Marks, Touch: Sensuous Theory and Multisensory Media (Minneapolis: University of Minnesota Press, 2002), 178. 4 Kerstin Stakemeier, "Prosthetic Productions. The Art of Digital Bodies," Texte Zur Kunst, March 2014, 166-181. 6 Engels, "The Part played by Labour in the Transition from Ape to Man" [online]. 7 John Roberts, The Intangibilities of Form: Skill and Deskilling in Art after the Readymade (London: Verso, 2007), 98. 9 According to Marx, the "principle" of large-scale industry was "to view each process of production in and for itself, and to resolve it into its constituent elements without looking first at the ability of the human hand to perform the new processes" with this bringing into existence "the whole of the modern science of technology," Karl Marx, see Chapter 15 "Machinery and Large-Scale Industry,” Capital Volume I (London: Penguin with New Left Review, 1976 edition translated by Ben Fowkes), 616. 10 Alexander Provan, "Gestural Abstractions," Artforum, March 2013. Accessed on alexanderprovan.com. 13 Laura Marks, "Immanence Online," Touch, 178. 14 References to clay in Joanne McNeil's recent article, "Touch to Feel," sheds light on this practice of molding and shaping in the context of screen-saturated culture. Discussing North Korea's "Pyongyang Touch," McNeil writes that it does not "connect to the internet…But it gives users the power to manipulate a screen environment like clay." 15 John Roberts, The Intangibilities of Form, 172. 18 John Roberts, "Art After Deskilling"
19 The Nail Art Museum was created for the ICA London panel discussion centering around Omar Kholeif's book, You are Here: Art After the Internet (ICA, London, June 18, 2014). 21 Andrés Vaccari, "Unweaving the Program: Stiegler and the Hegemony of Technics." Update July 2, 2014: In an earlier version of this article, the still image from Jaakko Pallasvuo's music video for Islaja's "Skeleton Walk" was credited as a still image from Pallasvuo's collaboration with Martin Kohout for the song "Houndin' Like a Dog." FraaaaancoNero | Tue, Jul 1st, 2014 1:55 p.m.